How To Lose Weight In 2 weeks Naturally? – A Perfect Guide To Achieve Your Weight Loss Goal! How to lose weight in 2 weeks naturally and get into that gorgeous slim fit dress? Dreams like this often go in vain because we think it is impossible to achieve a quick and healthy weight loss. But, with the right plan of action, zeal & commitment and a great self-discipline, is there anything on this planet that cannot be achieved? Yes! 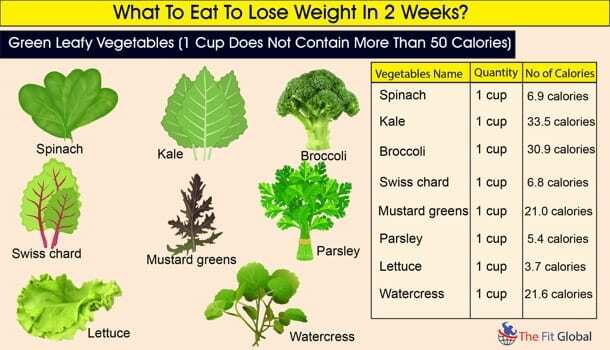 There is an effective way to lose weight in 2 weeks (just 14 days) if you are ready to put in the right efforts. But, without sticking on to 3 important rules, knowing the foods and workouts may be of absolutely no use! 3 Prominent Rules to Stand By! A successful weight loss, no matter which kind of a short-term or a long-term diet plan you refer to, revolves around three important aspects – A low-calorie healthy diet, exercise and the greatest of all, a positive mindset to achieve your weight loss goal. 1. Know What Kind Of A Diet Suits Your Weight Loss Regime? Do you know that the body weight you carry is measured in calories? When you gain calories, you look chubbier. So, when you want to look slim, you must cut down on your calorie consumption. But calories give you energy. So, you must be looking for healthy low-calorie food so that you do not drain yourself out of energy levels. 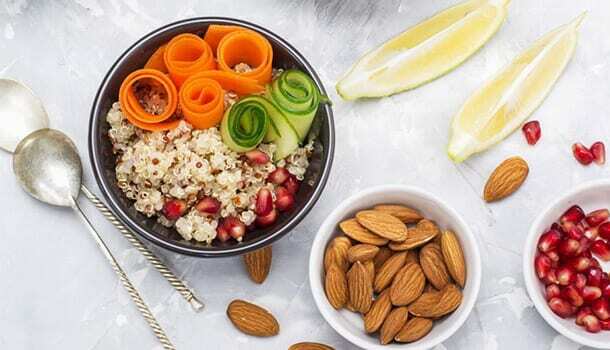 You must know what to eat to lose weight in 2 weeks for which a perfect list of low-calorie healthy foods is mentioned below referring which you can prepare your own diet plan. It is a general fact that proteins and carbohydrates fetch you with 4 calories per 1 gram and fats give you 9 calories for 1 gram. But, How To Know The Limits Of Your Calorie Consumption? It is a basic understanding that the calorie consumption required for a perfect weight loss varies from one person to another and this is because each person weighs different. Here is a perfect formula to calculate the exact calorie consumption that your body requires. Multiply your weight (in kilograms) by 29 to know your target calorie consumption. For example, if a person weighing 50 kilograms has to know the limit of his daily calorie consumption, he must multiply 50 with 29. So, his target calorie consumption per day should not exceed 1450 calories. So, now that you have the target calorie consumption with you, you have to make sure that the foods that you consume do not exceed the target calories. 2. Workout Hard Until You Sweat! You may restrict your calorie consumption by maintaining a perfect diet but there has to be a way to shed the extra calories that are already present in your body. The best way to achieve this is to exercise hard until you sweat. When you sweat while performing the exercise, it means that your body has burnt some calories. There are some best exercises mentioned in the article to help you lose weight naturally in 2 weeks. You just have to stick on to your exercise regime without missing on it any day. Making a strong affirmation does wonders to you in reaching your goals. Everyone secretly wishes to appear at their best by losing weight but not everyone puts in the required efforts. But, if you just stop for a second and think, it is your thought process that is guiding you towards your actions. So, never lose that positive mindset that you had while you decided to lose weight. Dreaming of losing weight every day and implementing this thought process into actions is the right way to achieve a successful weight loss. You just need 14 days of commitment and consistency! A Systematic Plan Of How To Lose Weight In 2 Weeks Naturally? All you require now is the list of healthy foods to be included in your diet so as to achieve a weight loss and a list of exercises that will help you lose weight. So, let’s start with the list of healthy weight loss foods and why they work the best for you! A. What To Eat To Lose Weight In 2 Weeks? Your diet plan can contain any of these 20 healthy weight loss foods. Consuming leafy greens is the best way to keep your stomach full. They further provide you with all the required nutrients and antioxidants. Studies have shown that eating leafy greens reduces your calorie consumption and at the same time, keeps your body occupied with rich nutrients. Make sure that your plate is filled with any of these leafy greens. 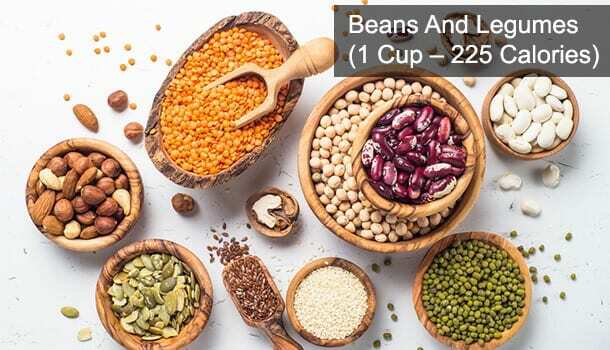 People who consume beans and legumes do not feel much hungry as the high protein content in these ingredients helps them stay full for longer periods. If you are looking for how to lose weight fast in 2 weeks, you have to necessarily include beans and legumes into your diet. You can include kidney beans, lentils, black beans, pinto beans, chickpeas, navy beans or peanuts into your healthy foods list. Eggs are a wonderful source of proteins. You must have by now observed that the consumption of eggs has always kept you full for longer periods and you did not feel any need of grabbing on any random food to satisfy your hunger needs. In fact, there was a study conducted on women who were overweight, consumed eggs for breakfast and their level of food consumption has decreased for the next 36 hours. If you love potatoes (generally considered as weight gain foods) but you are looking for an effective way to lose weight in 2 weeks, here is a perfect solution. 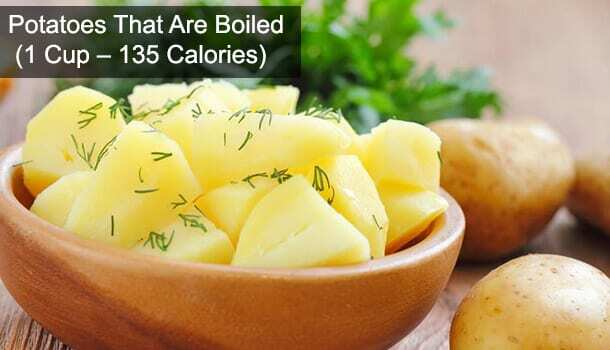 Consuming potatoes in the form of French fries obviously adds up the calories but boiling the potatoes is the best form of consumption since it gives only 261 calories. You will be able to see a reduction in the amount of food consumed later in the day since boiled potatoes can reduce your appetite. The best source of seafood with considerably fewer calories, rich proteins, and high nutrients is Salmon. They help in boosting your metabolism by improving your thyroid functioning. A good and fast metabolism is essential for a healthy weight loss. Fish like Salmon contains a good amount of proteins along with omega-3 fatty acids both of which assist in a significant weight loss. Nuts are a great source of fibres that help in an easy digestion. Protein content in nuts keep your stomach full for long periods. Apart from fibres and proteins, healthy fats present in nuts are much beneficial for your weight loss. You just have to make sure that you consume the nuts in moderation because they are quite high in calories. The best nuts that you can choose for a healthy weight loss include brazil nuts, walnuts, pistachios, peanuts, and almonds. Good news is that chia seeds are a good source of healthy carbs. This is because consuming around 30 grams of chia seeds provides your body with 12 grams of total carbohydrates, and most of the carbs are fibres which means that they do not further break down into sugar molecules which may add up to your weight. 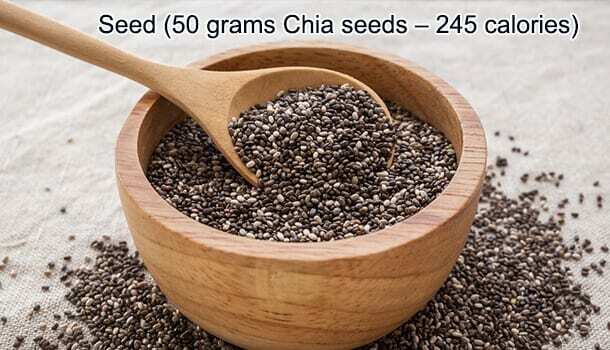 Chia seeds can reduce your appetite which assists in a good weight loss. Contrary to what it may seem, full-fat yoghurt is not harmful and it does not cause a weight gain. It is the low-fat-containing yoghurt that contains large amounts of sugar which may increase your calories. Yoghurt is a great fat burner. It furtherly keeps your gut healthy and clean because of the presence of good bacteria called probiotics in it. 9. How Fruits Are Going To Make Your Journey Easy? One reason why fruits are utterly essential for you to help you lose weight is that they reduce your hunger pangs. So, it is usually advisable to consume fruits prior to your lunchtime. Another surprising fact is that fruits are a good source of fibre that reduces the production of sugars into your blood which is one of the causes of weight gain. So, if you are looking for the fastest way to lose weight in 2 weeks, fruits should be your pre-lunch snacks! 10. Why Vegetable Soups Should Be Your Priority? A simple fact that often goes unnoticed is that consuming vegetable soups as the starters for your lunch is going to be a treat to your taste buds and it also reduces your appetite so that you do not grab on large quantities for the rest of your lunchtime. A soup should always come first in the menu list of your lunch. Some simple yet healthy examples of soups that promote weight loss include Tomato soup, coriander soup, mixed vegetable soup, beetroot soup, carrot soup, pumpkin soup and cabbage soup. 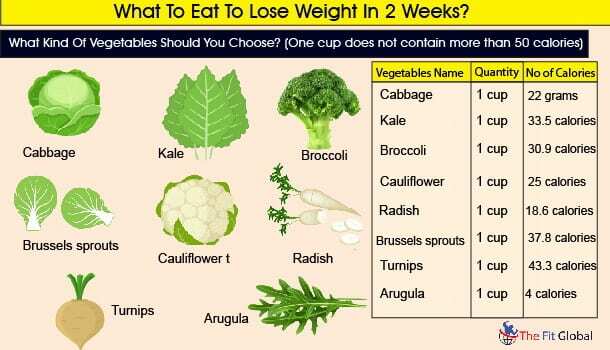 Vegetables like Cabbage, broccoli, cauliflower, radish, kale, Brussels sprouts, turnips and arugula are cruciferous vegetables that are the best foods for weight loss. This is because cruciferous vegetables are low in calories and high in fibres and proteins. So, the presence of fibres and proteins make you feel sated and do not let you eat in excess! Apart from aiding in weight loss, consuming cruciferous vegetables on a daily basis will also keep you away from cancer because of the anti-cancer compounds present in them. 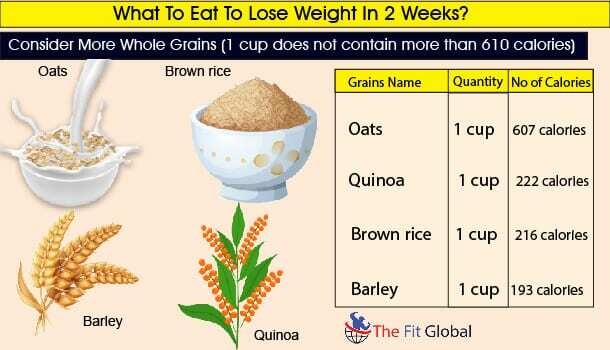 If you are looking for ways to lose weight naturally, it is a must that you include whole grains as a part of your diet. This is because most of the whole grains like oats contain fewer calories as much as only 500 calories for every pound. You do not need to restrict yourself while consuming whole grains and you can eat until you feel full because they do not let you gain weight much easily! Here is the list of whole grains that may assist in a good weight loss. Apple cider vinegar, a healthy weight loss drink contains acetic acid. Acetic acid or vinegar as it is popularly called promotes anti-obesity activities that help in weight loss. The drink can also improve your metabolism which further helps in promoting weight loss. The best thing about apple cider vinegar is that you can make the most out of it in two ways. You can dress your salads with a few tablespoons of apple cider vinegar to enjoy its amazing benefits for weight loss. The secret of most of the healthy and fittest people out there is this best drink that serves multipurpose benefits in aiding a healthy weight loss. Firstly, the drink helps in boosting your metabolic rate which helps in a significant weight loss due to the increase in the speed of metabolic activities in your body. Honey helps in the elimination of cholesterol from your body which is essential for a healthy weight loss. The drink also improves your digestion which keeps your gut happy and healthy for the rest of your day so that you are all set to start and complete your diet plan successfully. You simply need to warm up a glass of water, squeeze a fresh lime, add 2 tablespoons of honey and drink this on an empty stomach in the morning. 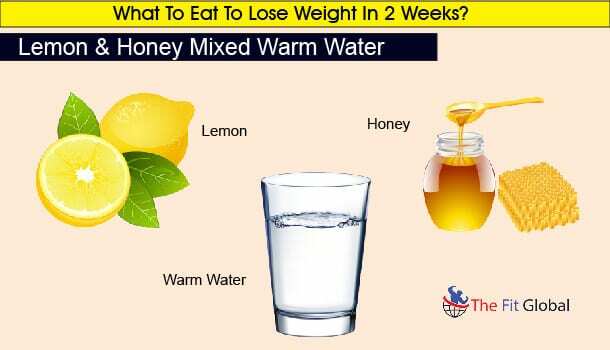 Drinking lemon-honey mixed warm water along with healthy weight loss foods is the fastest way to lose weight in 2 weeks. The healthiest way to lose weight in 2 weeks requires you to be mindful about your eating habits. You can start your day by drinking a glass of warm water mixed with lemon and honey. Include either eggs or oats in your breakfast. Try to keep your lunch simple by including at least one green leafy vegetable but having a soup as the starter is the best way to curb your hunger levels. Opt for more cruciferous vegetables. Munch on nuts & seeds during your snack time but ensure that they are consumed in moderation. Nuts & seeds are high in calories but safe when consumed in moderation. 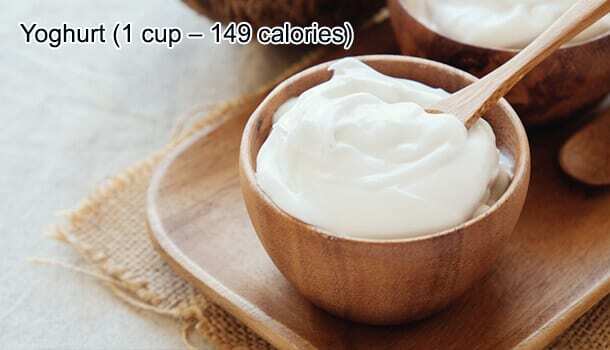 Do not forget to include a cup of full-fat yoghurt twice a day to keep your gut healthy. Most important of all, be mindful while eating by keeping a check on your calorie intake. B. Workouts – How Much Should You Work Out To Burn The Right Calories? If you are really looking for ways to lose weight in 2 weeks naturally, you need to remember that working out is as much essential as maintaining a healthy diet. Without workout, it is difficult to lose weight in a short span of just two weeks. The Amount Of Weight That You Lose Depends On The Number Of Calories You Burn! A woman who weighs around 70 kilograms if consumes 2000 calories per day but workouts to shed 2000 calories, she may not lose weight because the calorie consumption and calories being burnt are the same. But, if she works hard to burn an extra 1000 calories, i.e. if she consumes 2000 calories per day but burns 3000 calories for the same day, she might lose 1 kg in a week! List Of Workouts And How Many Calories They Burn! Set a goal of burning at least 1000 calories per day. The trick to losing weight lies in balancing your calorie intake and burning more amount of calories than you consume. If you weigh around 70 kilograms, try jogging for at least forty-five minutes twice a day. 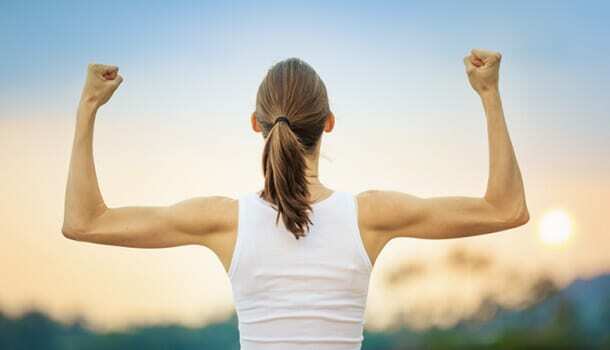 You may feel like switching to other modes of workout like sprint intervals, swimming, rock climbing or skipping each day but since your workout plan is for 2 weeks, sticking on to one simple workout like jogging or skipping may help you to cope up with the high intensity of the workout. Thanks for Sharing your nice and informative words on weight loss. In above article weight loss tips you have share are really fabulous as it’s a combination of both weight loss diet + Weight loss workouts which makes it’s perfect result oriented weight loss program. Informative article…….Keep it up…….